General Motors China engaged eight of its parts suppliers in a yearlong “Green Supply Chain” initiative designed to reduce energy consumption. The suppliers implemented 64 projects that resulted in emissions and facility noise reductions, as well as optimized lighting and energy management system improvements. Altogether, these suppliers realized savings of more than 9.3 million yuan ($1.3 million), and reduced carbon dioxide by more than 5,500 metric tons. This is the equivalent to the carbon sequestered by 142,000 trees grown in the U.S. for 10 years. 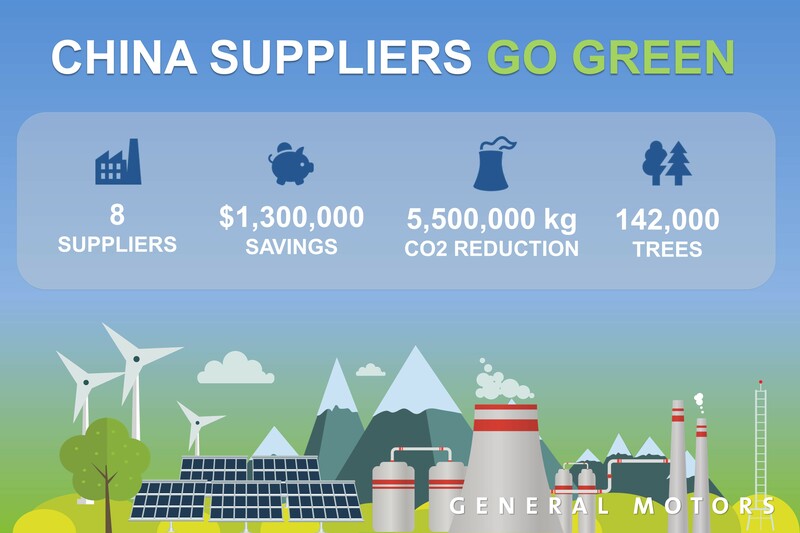 GM China supported the suppliers through training programs, energy audits and conservation projects. “GM China’s Green Supply Chain project provided professional guidance to us for identifying energy conservation opportunities and eventually achieving excellence in energy efficiency,” said David Wang, vice president of CMW (Tianjin) Industry Co. Ltd., one of the eight suppliers. GM’s purpose to serve its customers and communities extends to the company’s entire value chain, including its suppliers. GM is committed to sharing best practices with its 18,500 suppliers around the world to help lower the carbon footprint of manufacturing. For more information on GM’s supply chain sustainability efforts, visit its sustainability report. CMW (Tianjin) Industry Co. Ltd.